A concise, understandable breakdown of MQA was sorely needed. All of the info is in one place now. Very helpful and informative. Can't say I am surprised. Thanks, Chris. It's possible to play 24/352.8 on a class 1 device and without custom drivers. Chris, I see your point, but still ... Oversampling is performed by all delta sigma DAC chips. In Sabre it is quite advanced implementation and the target sample rate is 705.6/768kHz. Because of that oversampling we don't call all 44.1k recordings to be 705.6k. I see your point that MQA contains compressed info about high frequency content and standard Redbook content doesn't contain it. But that raises questions: What's the accuracy of that high frequency information and what's the accuracy of the hardware decoding/rendering process? It seems the high frequency content reconstruction is lossy process. It may be too strong to declare that 24/352.8 is played. Especially compared to the DXD original. "MQA has the ability to provide record labels with a single deliverable file and the consumer can verify this is the file s/he plays back at home. It's a cool concept." This is of no benefit to the consumer, only the record labels. So MQA *does* contain DRM - thats actually not "a cool concept". "Benefit" can be either for consumers or record labels - or both! It doesn't have to be a zero-sum game. And how does "verify this is the file s/he plays back at home" = "DRM"? Isn't DRM about deciding if you can play a file or not? And with MQA it decides how far you can unfold it. Or have I missed something? I think you've missed something. If you have the appropriate software and / or hardware, you can unfold the file as far as the software / hardware supports. 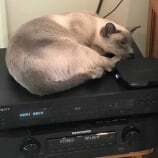 Just like DTS or Dolby Digital encoding on a Blu-Ray: it's not considered "DRM" if you don't have a Blu-Ray player that supports that feature, but you will only be able to playback the stereo content on the Blu-Ray . . . just like you can play back the Redbook content of an MQA file if you don't have a software or hardware device that supports MQA decoding. PS - I also don't think the "authentication" feature qualifies as "DRM". Nothing new about data compression reliability and always starting from 24 bits is great. Consumer verification at home is a major benefit to consumers. I'm guessing you don't want to purchase a high resolution download that was generated from a file of much lesser quality. You will know when this happens because the authentication light will not illuminate. I agree DRM in the classic sense isn't cool. I don't look at this as DRM in the classic sense. Hi John - I think MQA made a mistake calling it authentication. The connotation with that word is too negative. It makes this sound like the file is authenticated back to the mothership before playback. In this case, authentication only means you are playing the authentic file that was released by the label. Similar to clothing that has expensive hologram stickers on the tags so people know they are purchasing the real thing. While I agree with you to some extent, how could they have better indicated the genuine article? Many obsess over provenance, no? Isn't this what MQA guarantees? Provenance yes, but not in the sense that many see it. MQA guarantees provenance from the label. Once the file is distributed, there is a guarantee it will reach the consumer without alteration. I never thought this was an issue until I talked to more people involved in the distribution and sale of music. Labels are always free to deliver what they want (44.1 native or 44.1 upsampled to 352.8, etc...). MQA just guarantees we receive what the label sold. Thanks Chris, enjoyed the article. I note that you hinted that we can expect many more MQA DACs in the future, hopefully this year. Thanks Chris for this clarification. "You don't need a decoder to enjoy our standard sound quality - which is now widely agreed by the mastering communities to be superior to CD"
Is there available documentation which confirm that the mastering communities widely find that a lossy file which has been modified by the MQA dsp is superior to its untouched lossless original? I disagree. It is useful to know that a file is the original file and has not been modified. There are of course many other ways to do this (eg MD5) and it can be done without the lossy compression. Additionally, @Chris, I just don't get the crown jewel bit... Do you mean to say that the recording companies are now able to NOT sell you the original DXD master? That it is an advantage to them to sell you a maimed copy? So many other ways to do this without involving lossy compression... Seriously. This was the most suspicious piece of the whole writeup in my opinion. In my testing, defeating the software unfolding in the Tidal desktop app and playing the "direct pass through" on my Musical Fidelity M6si's USB input (which has never heard of MQA) sounded noticeably worse than the Red Book versions of the same tracks. Duller, flatter, less dynamic and with a narrower stereo image. Software unfolding is a must to make these files sound passable. It would also be great to get some clarity around Auralic's plans concerning software unfolding on its Aries line - their Facebook page made some mention of a forthcoming "proprietary upsampling" algorithm, but it sounds like MQA unfolding is more than a simple up sample. As an audiophile, I see no need for the lossy compression part of it unless it's streamed. Even then, who cares about the sound quality for streaming? I don't see it as the major delivery method for audiophiles. I have a feeling there will be only MQA compressed files eventually. Highly unlikely that the major labels are gonna want to distribute multiple formats. But I'd like to see MQA de-blurred sans compression as an option. I'm not aware of any documentation effort that's public. I know some mastering engineers have participated in videos, without compensation, for MQA. Anyone who owns the content can sell whatever they want. Now, similar to the movie studios, they can sell you something other than the original master that is purported to be as good or better. This claim is debated heavily though. The lossy compression bit is a little misleading. This lossy is far different than the lossy of MP3 or AAC. The judgements about sound quality without a decoder have been all over the board. Some tracks are better or worse without a decoder and some people are all or nothing on it as well. It's not a black and white thing though. Those who have been claiming un-decoded MQA is inferior by showing graphs and technical analysis, have so far not agreed to take any listening tests that would backup the claim. When I think about lossy, I ask myself what is lost. With MP3 and AAC real music is lost. With MQA I don't believe real music is lost. MQA changes digital, making existing terminology require more discussion than in the past. Well, I'm sure there are loads of us that do care about the sound quality for streaming. I certainly do or I'd be using Spotify or Apple Music. True. The same is true with upsampling: most of the time we are listening to an upsampled version of the original file and we like it. My point is MQA per-se is not a better solution than delivering the high res file itself. Whether the difference can be heard, or whether the result of hardware decoding compensates for shortcoming in cheaper DAC chips are different questions. Many MQA titles I've listened to sound better than other versions I have, including the ones billed as "high resolution" (eg Joni Mitchell's 'Blue' or 'Both Sides Now'). I frankly don't care what shenanigans MQA is coming up, I like the result, and as such I will be a customer. I use streaming everyday not only in the car, but in my main system. I care about sound quality almost always.